Brussels is extending the highest level of terror alert because of the “serious and imminent” threat of Paris-style attacks, Belgium’s PM Charles Michel has announced. The prime minister added that universities, schools and the metro would stay shut. Belgium’s capital has been on lockdown all weekend, amid a manhunt for suspected Paris attacker Salah Abdeslam. ISIS militants, some of them from Brussels, killed 130 people in Paris on November 13. Security forces completed several operations in Brussels on Sunday night, the AFP news agency reports. The police had urged the public not to report its movements on social media. On November 22, PM Charles Michel told reporters in Brussels that the authorities fear “an attack similar to the one in Paris, with several individuals who could also possibly launch several attacks at the same time in multiple locations”. Earlier, Belgian Interior Minister Jan Jambon said the danger to Belgium was not tied to Salah Abdeslam alone. “The threat is broader than the one suspected terrorist,” he told Flemish broadcaster VRT. It was not clear if Jan Jambon was referring to those involved in the Paris attacks, or others who might be planning attacks in Belgium. 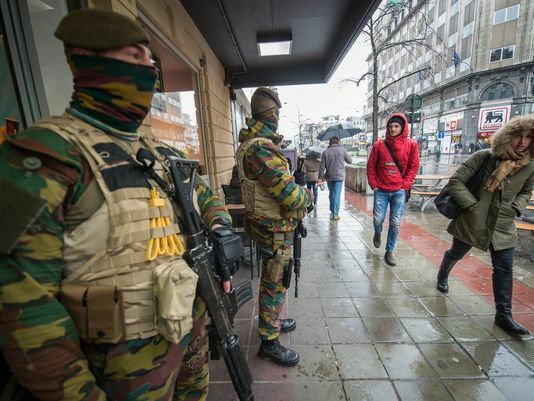 Soldiers joined police officers on patrols in Brussels over the weekend. Many public spaces in the usually bustling capital were deserted, as people heeded official warnings to avoid crowds. The Belgian authorities have so far charged three people with involvement in the Paris attacks, claimed by ISIS. French media have reported that nine militants carried out the attacks, and seven died on the same night. One of the men who drove Salah Abdeslam to Belgium told his lawyer that he was dressed in a “big jacket” and may have had a suicide belt. The lawyer, Carine Couquelet, told French TV this raised questions, including the possibility that Salah Abdeslam may have been supposed to blow himself up in Paris but had had second thoughts. Friends of Salah Abdeslam told ABC News they had spoken to him on Skype and said he was hiding in Brussels and desperately trying to get to Syria. They said Salah Abdeslam was caught between European authorities hunting him and ISIS members who were “watching him” and were unhappy that he had not detonated his suicide belt.